We laughed; we cried; we screamed during The Office series finale last night. I was even weeping during the interview special! We’re celebrating The Office with a tribute to The Office‘s most popular DiSC styles on our DiSC Profiles Blog. Everyone loves a good post about DiSC Profiles of famous people and TV show characters. Well, check out this one! I have been a huge a fan of NBC’s The Office from the very beginning. I cried when Jim finally told Pam how he felt on casino night. I gasped when Stanley uttered the words, “Did I stutter?” and laughed hysterically when Angela threw her cat into the ceiling to try to save him during Dwight’s fire drill. I’m sad to see The Office go! What made The Office such a hit (besides the bizarre scenarios and extremely awkward moments) was that the mockumentary hit close to home… err… office. Although I never worked for a “Michael Scott” per-say, NBC’s extraordinary take on ordinary characters made me think of my own version of Michael Scott, a boss I had quite some time ago. 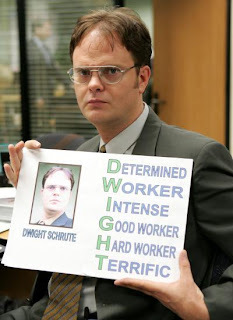 Who do you think would be the D style in The Office?